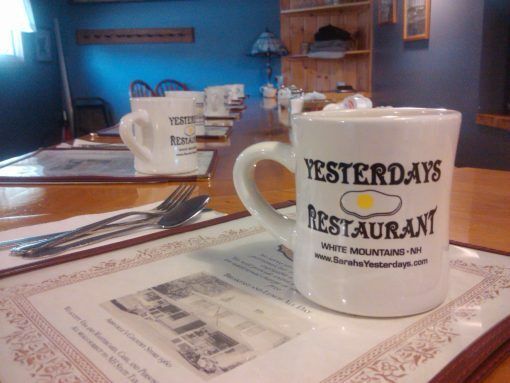 Yesterdays - Jackson NH and Mt. Washington Valley Area Information. Pumpkin People, Tradionally Yours Events, Lodging specials, Dining and Ski Area Info. Cross over the covered bridge into the charming Jackson Village and come by the newly renovated Yesterdays Restaurant. Enjoy a nice hot cup of coffee that will constantly be full and some savory food that will leave you satisfied. If you’re one who enjoys spending your time outside, come on in and place an order to go, then head over to the beautiful Jackson Falls. We do all our own baking, and make everything to order. BYOB.